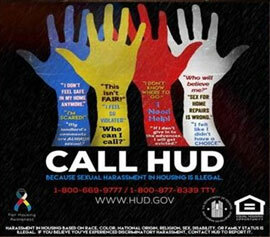 Earlier today, HUD published a press release announcing a campaign “to help protect people from harassment by landlords, property managers, and maintenance workers in HUD-assisted housing.” The campaign–named “Call HUD: Because Sexual Harassment in Housing is Illegal”–will educate people on what activities constitute sexual harassment and who to contact if people experience it. The campaign will also offer sexual harassment training to PHAs and other housing providers. HUD will introduce the “Call HUD” campaign at HUD headquarters on Thursday, April 4th from 2 pm to 4 pm at the Brooke-Mondale Auditorium. Persons who believe they have experienced discrimination may file a complaint by contacting HUD’s Office of Fair Housing and Equal Opportunity at (800) 669-9777 or (800) 927-9275. The complete press release may be found here.